Ms Carolyn Hewson AO, Ms Amanda Price McGregor, and Mr Robert Rust join inaugural chair Mr Tony Shepherd AO, and three chief executives from the South Australian public service. “Infrastructure SA will transform the way our state’s infrastructure is planned and built,” said Premier Steven Marshall. “It’s a real coup to secure people of the calibre of Carolyn Hewson, Amanda Price-McGregor and Robert Rust, who each bring their own expertise and experience to this important organisation. 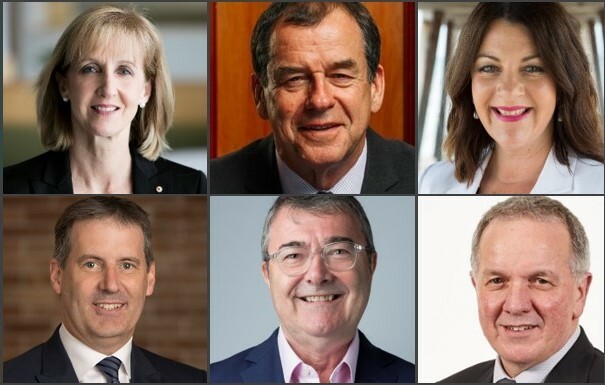 Clockwise from top left: Carolyn Hewson AO, Robert Rust, Amanda Price McGregor, Tony Braxton-Smith (DPTI), Jim McDowell (DPC) and David Reynolds (DTF). “There was very strong interest in the Infrastructure SA board positions and the Government received expressions of interest from more than one hundred people, including many outstanding candidates. “Infrastructure SA is an independent body that will utilise private and public sector expertise to develop a 20-year state infrastructure strategy and 5-year infrastructure plans. “My government has been working from the day we were elected to build a strong pipeline of infrastructure projects to grow our economy, support local jobs, and meet the needs of communities across Adelaide and in the regions. “Our first State Budget delivered a record level of infrastructure spending, with $11.3 billion of infrastructure works budgeted over the next four years alone. Ms Carolyn Hewson AO – Over 35 years’ experience in the financial sector; currently a non-executive director of BHP; significant corporate board experience. Ms Amanda Price-McGregor – Managing Principal Consultant and owner of Green Light Planning Solutions; more than 20 years’ experience in infrastructure planning, strategy development, project execution and development approvals in public and private sectors. Mr Robert Rust – 40 years’ experience working on major projects for both the public and private sectors, including economic and social infrastructure public private partnerships across road, rail, energy, health, and stadia sectors. These final board appointments are in addition to the previous ex-officio appointments of the Chief Executives of the Department of the Premier and Cabinet, Department of Treasury and Finance, and Department of Planning, Transport and Infrastructure.